Show Your Employers Appreciation With Custom Pen Sets: Get them the gift that lasts for a long time, fantastic personalized pens and pen gift sets from Executive Advertising! These promo items are top promotions at any office. Every office needs pens and especially branded pens with your company name! You’ve come to the right place for promotional pens and pen sets, we specialize in the top quality of pens and magnificent pen sets. All of our prices are affordable and these items are ready for customizing with No Set Up Fees. How does your clients remember you? By you handing out free advertising pens to them with your logo. 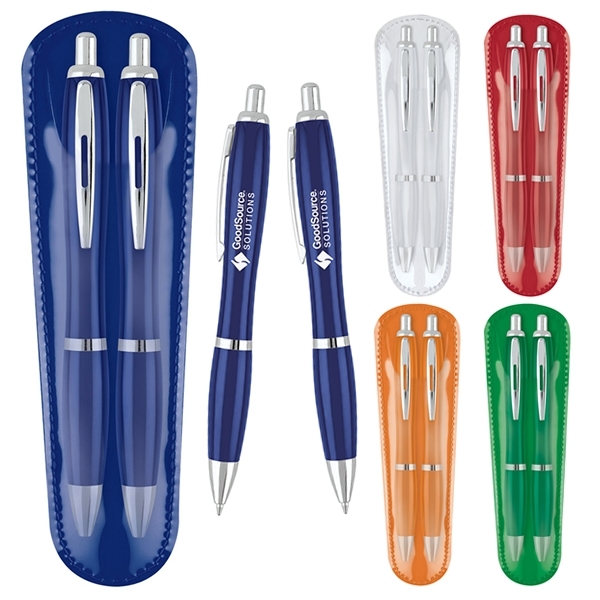 Since logo pens are a must have, you can stock up now and anytime on our marketing pens for your business. Our sales team is ready to help you with your bulk of company pens and assisting you on your special imprint and free logo. Our custom pen sets will be one of the best ideas for company gifts this holiday season, look at the picture, this is our Curvaceous Pen Pencil Set their is orange, red, blue and green sets that you could considering branding. These sets would make great stocking stuffers and appreciation gifts to associates this year. Shop Executive Advertising for the best pens and pen sets around, just shop our website for best quality, colors and low prices to get your gift buying going. Need any other ideas or assistance in gift buying this year or other pen set choices, we’re ready to assist you! Give the gift of promotional pens, you’ll love our extra nice pens for you office logo, promo pens is a promo that will be used for years to come. Next post50 Best Employee Christmas Gift Ideas For 2016!